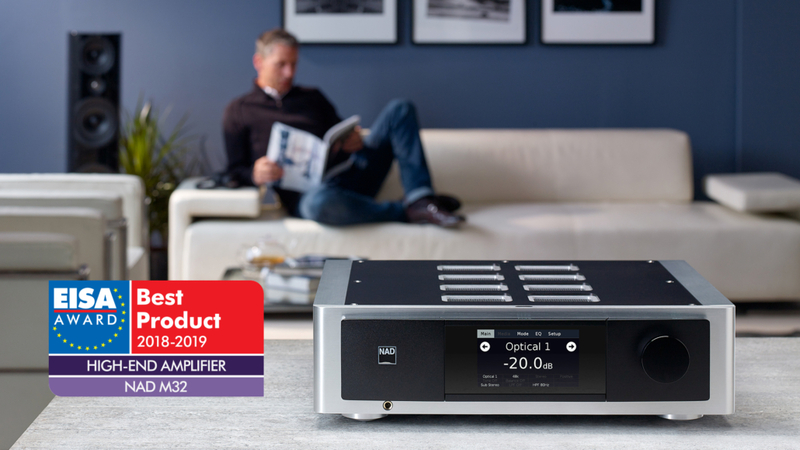 After winning a Highly Commended Award from Hi-Fi News, the NAD M32 DirectDigital™ Amplifier has won yet another prestigious honour for Best High-End Amplifier from the European Imaging and Sound Association (EISA). Comprised of 55 international consumer electronics magazines, EISA selects its winners based on a collection of tests and reviews that are conducted on hundreds of products over the course of a year. As NAD’s flagship integrated Masters Series amplifier, the M32 is equipped with everything from NAD’s innovative Modular Design Construction (MDC), to NAD’s equally revolutionary music operating system, BluOS®. By combining all pre-amplification and power amplification functions into a single amplifying stage, the M32 is the ultimate amp for your home entertainment system. We understand that a client’s purchase represents a vote of confidence and trust in our ability to provide products and services that will hopefully bring pleasure to a client’s family. As such, our pledge is to treat clients exactly as we ourselves wish to be treated. A client’s budget, no matter how great or modest, will be utilized as if we were spending our own, hard-earned money.